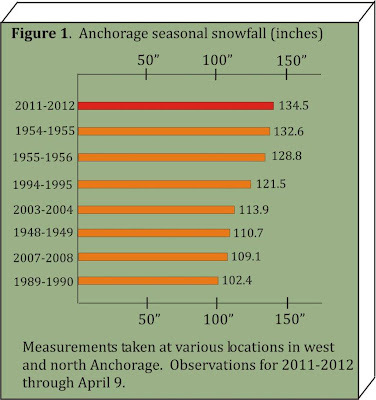 9 PM Update: Updated chart through April 9. AND 7 PM WHICH BRINGS THE TOTAL FOR THE DAY TO 4.3 INCHES. WAS 132.6 INCHES SET IN 1954-1955. Warmest March, Warmest 1st Quarter, Warmest 12 Months Apr-Mar, 2nd Warmest Oct-Mar in U.S.
April 9, AM Update: The National Climatic Data Center (NCDC) posted the preliminary U.S. climate summary for March this morning. 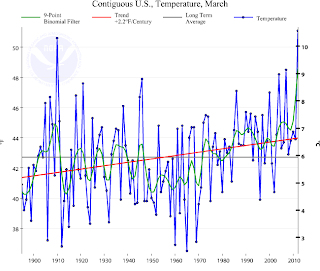 The report confirmed that this was the warmest March for the contiguous 48 states since the beginning of official national climate statistics in 1895. 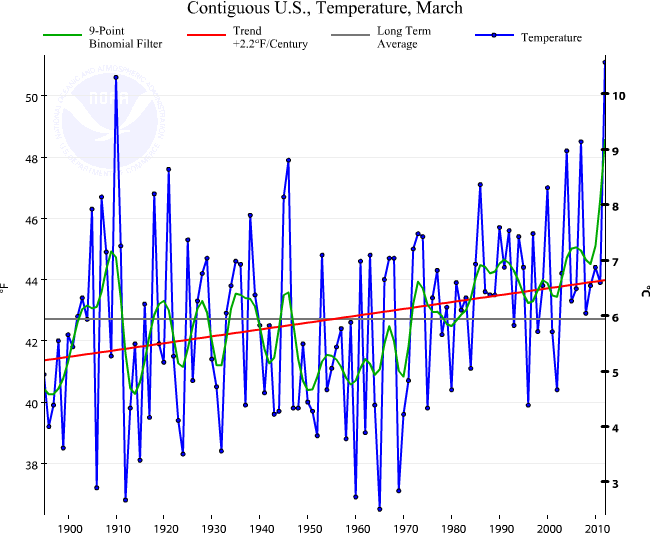 The average temperature of 51.1° was 8.6° above the long-term March average and a significant 0.5° above the previous record in March 1910. The only previous month in 118 years of data with a greater departure from average was January 2006. The only state with below-average temeperatures was Washington. The average temperature of 42.0° for January-March in the contiguous U.S. was also the warmest on record at 6.0° above the long-term average. 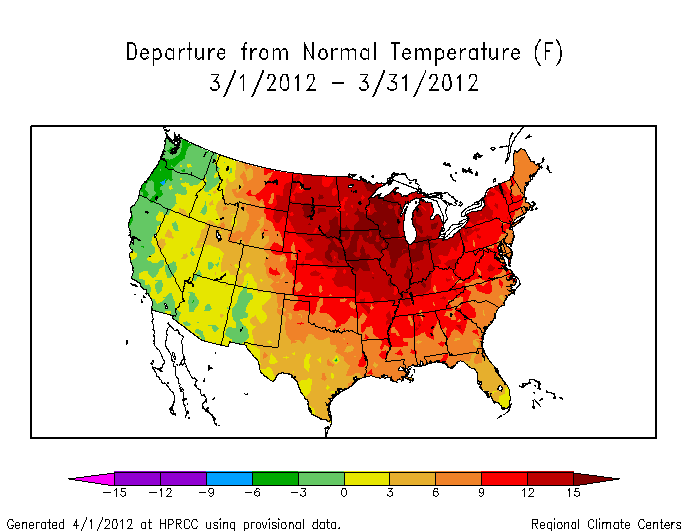 For the 3 months, 25 states had their warmest first quarter, and 16 more had top-10 temperatures. 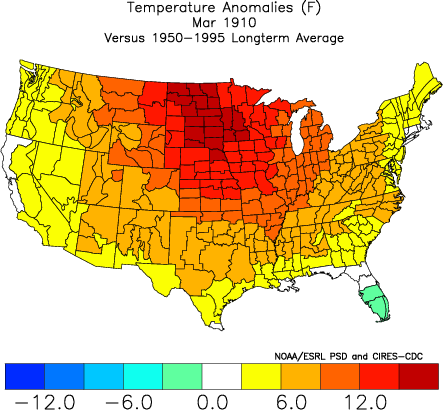 For the 6-month cold season (October-March), it was the second warmest on record (3.8° above average) for the contiguous U.S., behind 1999-2000. 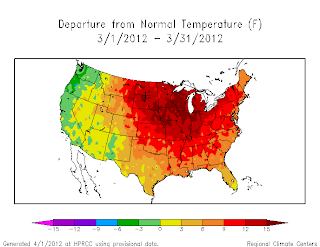 There were 21 states across most of the Northeast and Midwest with record warm cold seasons. Details to be posted as they are available.